The 16th entry in Toho's Godzilla series, 'The Return of Godzilla' is a stark political masterpiece. Note – this review is for the original 1984 Japanese version. Thirty years after its attack on Tokyo in 1954, Godzilla reappears in modern Japan. The Japanese government struggles to maintain diplomatic relations amidst rising pressure from the US and the Soviet Union to use nuclear weapons to destroy Godzilla. Meanwhile, scientist Dr. Hayashida, reporter Goro Maki, sailor Hiroshi Okumura, and his sister Naoko work toward drawing Godzilla toward a fiery demise on Mount Mihara. Director Koji Hashimoto’s The Return of Godzilla (1984) is one of the most political entries in the Godzilla series; topped only by the superb Shin Godzilla (2016) in that regard. Its emphasis on cold war tensions at the forefront of its narrative is emblematic of the cultural value Godzilla films have. In a careful examination of a film such as this, one finds that the casual disregard and scorn that most film critics have heaped upon the Godzilla series is not only unfounded, but shows a lack of consideration. With a brilliant musical score by Reijiro Koroku, fantastic special effects, and some excellent camera work, The Return of Godzilla is arguably one of the best Godzilla films to date, and one that retains its nuclear poignancy over thirty years on. The beginnings of The Return of Godzilla however, began surprisingly with Disney. In 1975, the Godzilla series went into hibernation with the last of the original run of films (dubbed the ‘Shōwa’ era after Emperor Hirohito’s posthumous name) released. In the nine years that were to follow, Toho signed a deal with Disney in 1980 making them the Japanese licensor for all Disney films (including its extensive back-catalogue of animated classics like Bambi). 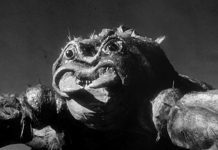 At the same time, Toho began re-releasing many of their older films including Kurosawa epics like The Seven Samurai (1954), as well as some of the 1960s’ Godzilla entries like Mothra vs. Godzilla (1964) and Invasion of Astro-Monster (1965). At Toho’s 50th anniversary film festival in 1982, Toho found that their Godzilla screenings were drawing larger audiences than both their Disney and Kurosawa offerings. Unsurprisingly, on December 26th 1983, Toho announced the production of a new Godzilla film, the 16th in the series overall. The story of The Return of Godzilla is one that intertwines familiar Godzilla narrative beats into a political thriller. Indeed, the strongest element of The Return of Godzilla’s narrative is its emphasis on the cold war, and how that affects the response to Godzilla’s appearance. 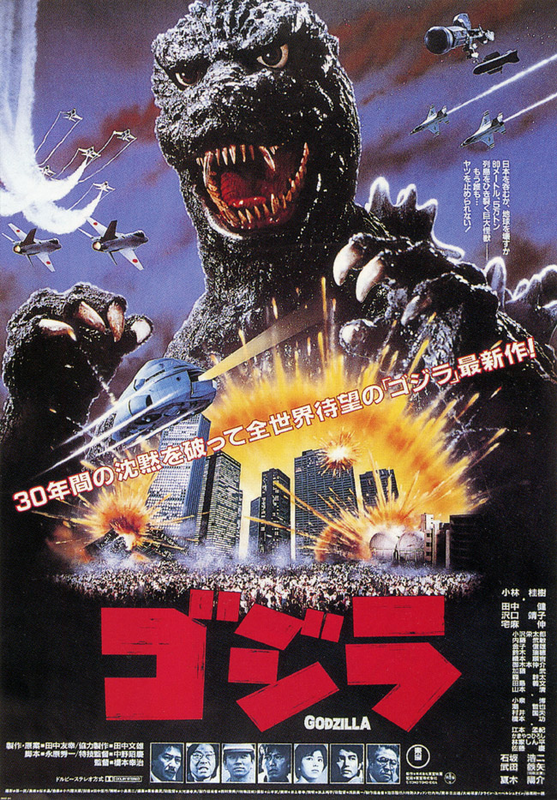 With Godzilla’s reappearance in Japan in the mid-1980s, the cold war powers turn their attention to Japan. In perhaps their only agreement, the United States and the Soviet Union both argue fervently for the unrestricted use of nuclear weapons against Godzilla. The Japanese Prime Minister refuses, citing Japan’s three non-nuclear principles, much to the dismay of the American and Soviet powers. Despite Japan’s decision, both the US and the USSR have installed satellites armed with nuclear warheads above Japan. Upon Godzilla’s first attack on mainland Japan the Soviet warhead is accidentally launched, putting Japan at the mercy of nuclear annihilation, until the US manage to launch their own missile to destroy the incoming Soviet device. To call it tense is an understatement. In one of the film’s best sequences, the American and Soviet envoys sit either side of the Japanese Prime Minister; Japan caught between the nuclear giants. The cuts of editor Yoshitami Kuroiwa are sharp like the barked words of the envoys, and some excellent camera work frames Prime Minister Mitamura (Keiju Kobayashi) in soft-blur in the foreground whilst the envoys stare grim-faced at him. Like the PM, Japan is a far-off place where nuclear vapidities can be thrown without repercussion. The PM’s stoic dignity in saying that Japan will not use nuclear weapons does little to persuade the foreign powers; a quiet moment that speaks to the blind confidence in atomic weaponry both the US and the Soviets represented during the 1950s at the beginning of the cold war (and the decade Godzilla first emerged). Perhaps the US envoy’s remark of ‘this is no time to be discussing principles’ is not subtle, but such a statement is the pinnacle of the sequence, and lingers in the mind. It is the culmination of nuclear anguish. This sequence is made far more powerful when the audience learns that both powers have still installed nuclear-armed satellites above Japan despite telling the PM they would stand down. It ultimately does not matter what Japan says, the US and Soviet faith in atomic power is unstinting. Finally, when one considers both powers’ eagerness to unleash the atom (albeit as a defensive measure) on a nation where two cities were obliterated by such weaponry, the worries of the PM’s cabinet that Japan is simply a guinea pig for the Soviets and Americans becomes all the more poignant (and is a concept that is explored again in Shin Godzilla). Moments such as these give The Return of Godzilla a degree of nuance one may not expect from it. While its narrative and political themes elevate it, the film is lacking in some of its characters. 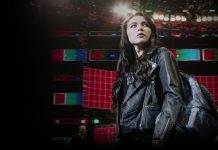 There are standout performances and individuals, but as a whole, the film’s heroes aren’t as fully realised as one might hope. Goro Maki, the cunning reporter, is the biggest offender in this regard. He uses the trust of Naoko, desperate to know if her brother Hiroshi is alive after his ship is wrecked, to gain a heartwarming front-page story. When she confronts him, he does not apologise, nor does he apologise later in the film. While he and Naoko appear to grow fond of one another in the midst of crisis as Godzilla’s rampage traps them in a crumbling skyscraper, he still does not find it in himself to apologise. The result is an emotionally ambivalent embrace between the characters with one left wondering has she forgiven him? Does he regret using her? Regardless of one’s conclusions, one is left unsatisfied. Perhaps had he actively recognised his wrongdoing, one would be more emotionally invested in the pair’s personal connection. Naoko is also unfortunately a weak protagonist, rarely developing beyond subdued anxiety and worry. For a film that demonstrates such a progressive stance toward nuclear weapons, it is a shame that a similarly progressive approach was not adopted for the writing of her character. Dr. Hayashida and the Japanese Prime Minister on the other hand, stand as striking and poignant characters. Dr. Hayashida explains that he lost both of his parents to Godzilla’s attack in 1954, but that he no longer wants revenge for their deaths. On the contrary, Dr. Hayashida demonstrates both a scientific and personal fascination with Godzilla comparable to Dr. Yamane’s character in the original 1954 film. ‘Didn’t you feel something for it at the nuclear plant?’ he asks. Brilliantly played by Yôsuke Natsuki, Dr. Hayashida has a quiet reverence about him. Without ponderous exposition, one senses the history his character has had with Godzilla. That his hatred for the beast has been changed to a state of fascination is a subtle bit of brilliance in his character; though it might seem a little too understated for some. Prime Minister Mitamura carries the brunt of the film’s tension, taking the audience through sequences of political instability and diplomatic strain. Much like Natsuki, Keiju Kobayashi imbues his character with a quiet, stoic nature. His firm, unstinting performance as the American and Soviet envoys argue for the use of nuclear weapons is one of the film’s many highlights. Making that performance all the more dramatic are the touches of anxiety Kobayashi lends to the PM in scenes where he is alone but for a few aids. His performance is of a man emotionally defeated in the face of the brutish calls for an atomic deterrent, but morally undefeated in standing up for principle. In the final moments of the film, the PM is close to tears at the sight of Godzilla’s end, perhaps his emotions let loose seeing the source of such global tension before his eyes, an animal lost and dying. This brings us neatly to Godzilla itself. With an updated design (essentially a prototype of how he would appear in the Heisei run of Godzilla films), Godzilla is frightening, loud, and menacing. Godzilla has a character of his own, though. The monster shows moments of contemplation, anger, and pain. Godzilla is as much a part of the character dynamics as the human cast is. Special effects director Teruyoshi Nakano gifts The Return of Godzilla with some spectacular imagery. With the Shinjuku ward of Tokyo meticulously crafted in convincing miniatures, the scale of Godzilla’s attack is elevated. Some fantastic low-angle camera work adds to the power of Godzilla. One shot in particular frames Godzilla breaking through the side of a skyscraper, sending debris and rubble falling toward the camera. It is an awesome sight. The pinnacle of the effects work is no doubt when Godzilla destroys the flying war machine Super-X, toppling a skyscraper onto the doomed craft. The massive building shatters with an almighty rumble as smoke billows out from beneath it. As the smoke and debris clear, Godzilla looms in the background lit by fires beneath him. It is an incredibly powerful image. Adding to such power is the wonderful musical score by Reijiro Koroku. Godzilla’s attack on the Nihama Nuclear Plant is scored with a menacing and sinister piece. With a touch of the piano, the music builds incredible tension. Often using lingering notes when Godzilla is on-screen, Koroku’s score lends itself intensely to the fear of the beast. To conclude, The Return of Godzilla is one of the very best of Toho’s Godzilla entries. After more than thirty years, it has aged exceptionally well. With a standout score, fabulous cinematography, stunning special effects, and nuanced performances from Yôsuke Natsuki and Keiju Kobayashi, this is an excellent film. A few underdeveloped characters in Goro Maki and Naoki perhaps hold the film back, but they do not hurt the film irreparably either. With its themes of political unrest, the frightening US and Soviet willingness to use nuclear weapons has unfortunately found a further dimension in the real political landscape of 2017. Films like The Return of Godzilla are culturally significant; they enable us to come to terms with such horrors, and have the capacity to educate for better or worse. Let us hope that unlike the events of the film, a nuclear device is not launched – accidentally or otherwise. Films like The Return of Godzilla are culturally significant; they enable us to come to terms with such horrors, and have the capacity to educate for better or worse. GODZILLA 1985, which is the version of the movie many Americans were exposed to. However it’s such a botched and altered cut that its practically a different movie. I’m guessing that’s the main reason G’84 isn’t discussed much in Western G Fan circles. But it can’t be ignored. This film paved the way for the next generation of tokusatsu cinema, including Kaneko’s wonderful GAMERA films from the 90’s. Glad to see there are still some viewers out there who appreciate it. Thanks again!